Conveyance systems designed to artificially infiltrate urban stormwater typically consist of perforated pipes embedded in stone-filled trenches installed within the road right-of-way or along the rear yard lot line. Stormwater is directed to the perforated pipe through catchbasins and runoff is captured and stored in the trench where it is allowed to infiltrate into the surrounding soils. Runoff in excess of the soil infiltration capacity is routed to the storm sewer. 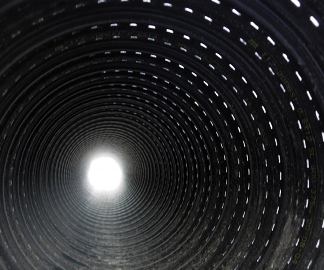 Perforated pipe systems are usually combined with other pre-treatment best management practices such as vegetated swales or sediment traps to avoid clogging with sediment or hydrocarbons. Pollutants are filtered out of the stormwater as it infiltrates into the surrounding soils and the infiltrated runoff helps to sustain groundwater recharge and maintain baseflows in nearby streams. The applicability of perforated pipe systems may be limited by several factors, including the permeability of native soils, elevation of the groundwater table and slope of the surrounding lands. The potential for groundwater contamination must also be considered in selecting suitable sites for perforated pipe systems, as some soluble constituents such as road de-icing salts are not filtered out of runoff by native soils. As a general rule, conveyance perforated pipe systems should not be used in areas that are vulnerable to spills of chemicals or hazardous materials.